Korea Times Music Festival: final call. This year’s KTMF at the Hollywood Bowl in Los Angeles is roughly two weeks away, and it looks to be a spectacular event in the making. To fans who have their tickets and have finalized their travel plans—enjoy the fireworks, and don’t forget to tell the rest of us all about it when you get back home! The new 2010 Korean Music Festival website is live. » You can visit it HERE. ~ by Cloud USA on April 14, 2010. 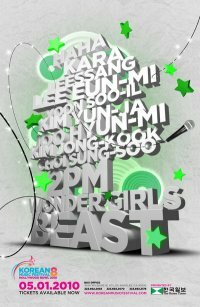 I wanna go sooooooooooo bad, 2pm and beast Omfghavdkjwqabdvuwq. why do i have to live sooo far away.